I figure you’re the best source to get word of this out. Heartland America (1-800-229-2901) (www.heartlandamerica.com) is selling refurbished Grundig Executive Satellit receivers for $129.99 (MSRP $229.99). The ad states “Factory serviced to meet original quality standards – may have slight cosmetic blemishes”. It is Item No. 1Z-94828. I have one of these I bought earlier this year on a similar deal from Heartland America. It works and plays perfectly and if there is a blemish, I’ve yet to find it. This is an excellent portable at a bargain price. Excellent, John! Thanks for the tip! Click here to view this deal at Heartland America. This entry was posted in Deals, News, Shortwave Radio and tagged Grundig Executive Satellit, Heartland America, John Figliozzi, Radio Deals on November 20, 2018 by Thomas. As John pointed out, there is some serious nostalgia to be found here! Thanks for the tip, John! This entry was posted in News, Nostalgia, Radio History and tagged John Figliozzi, Radio History on July 24, 2018 by Thomas. I’m very pleased to have received the 8th edition of John Figliozzi’s Worldwide Listening Guide (WWLG), the latest, most updated version of the excellent guide I’ve often reviewed. SWLing Post readers know that I’m a huge fan of the Word Radio TV Handbook (WRTH); it’s my go-to guide for radio frequencies and schedules. Figliozzi’s Worldwide Listening Guide is my go-to for programming and content, not only helpful on the shortwaves, but especially handy when tracking online content. Indeed, the WWLG is a unique guide–there’s nothing quite like it on the market. As I’ve said, you may want a copy of the WWLG in your shack, especially alongside your computer or Wi-Fi radio. Like many SWLs, I’m something of a “Content DXer:” I love chasing obscure programming––news, documentaries, music, and variety shows, anything the broadcasting world has to offer. For this, I often turn to Wi-Fi radio. Wi-Fi radio offers the discerning listener the ability to track down fascinating regional content from every corner of the globe––content never actually intended for an international audience. Digging into local content via a WiFi radio isn’t nearly as challenging or fun (for me, at least) as scanning the shortwave bands in search of elusive weak signal DX or pop-up pirate radio station. Though my WiFi radio offers an easy and reliable way to “tune” to online content, the actual content discovery part is quite difficult. Truth is, there’s so much content out there–tens of thousands of stations and shows–it’s hard to know where to start! This is where the WWLG comes in: Figliozzi exhaustively curates more than 4,000 programs (! ), indexing their airing times, stations, days of broadcast, program types, frequencies, and web addresses. Additionally, he sorts the programs by genre: arts, culture, history, music, sports, and more. And Figliozzi also includes a well-thought-out directory of at least forty genres. In short, this directory has helped me not just locate, but identify, programming I would never have known about otherwise. Frankly, I’m not sure how Figliozzi manages to curate such a vast assortment of programming. But I’m happy that he does, and especially, that he offers it for the SWL’s benefit––! As I’ve said many time before, the WWLG has become a permanent reference book in my shack, alongside my trusty WRTH. There’s a surprising amount of information packed into this slim, spiral-bound book…enough to keep even a seasoned content DXer happy for years. This entry was posted in Books, Broadcasters, News, Schedules and Frequencies, Shortwave Radio, WiFi Radio and tagged John Figliozzi, Review of the Worldwide Listening Guide, The Worldwide Listening Guide, WRTH, WWLG on December 5, 2017 by Thomas. Many thanks to SWLing Post contributor, Troy Riedel, who notes that Universal Radio is now taking pre-orders for the 8th edition of the Worldwide Listening Guide by John Figliozzi. Click here to check it out on the Universal Radio website. This entry was posted in Books, News, Schedules and Frequencies, Shortwave Radio and tagged Books, John Figliozzi, Shortwave Schedules, The Worldwide Listening Guide, Troy Riedel, Universal Radio on November 6, 2017 by Thomas. It’s a Chinese company with a rather novel approach to the design of modern radios — AM/FM/Internet Bluetooth, along with the use of tube amplifiers in some models. The web site is almost all in Chinese but the pictures are cool. Air Smart Audio is the parent company; Muzen Audio the subsidiary. 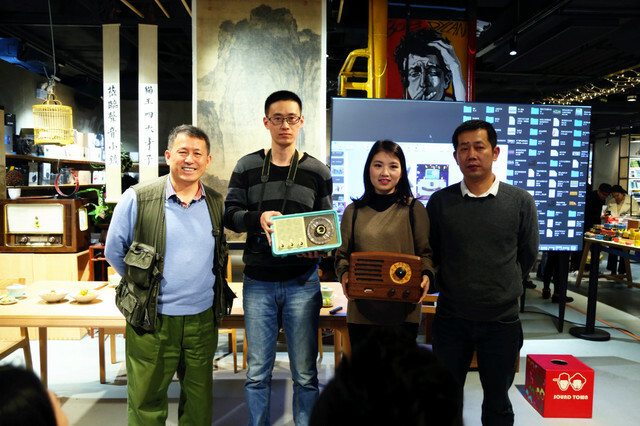 The company received a 2017 CES Innovation Award for their new AM/FM/internet radio and Bluetooth speaker lines, the fifth CES Innovation Award received by Zeng. Muzen Audio also designs a series of vintage-style tube amplifier radios and what the company calls “on-the-road” radios. From what I gather, Muzen radios are very much “boutique” radios, thus come with a “boutique” price tag–some models costing as much as $500 US. Still: it’s refreshing to see a Chinese radio manufacturer marching to their own beat, making handcrafted products in small batches. The Classic 1 is handmade and crafted with real rosewood, and every unit comes with a unique code verifying its hand craftsmanship. Frequency response of the speaker is 75Hz to 16KHz, of the amplifier, 30Hz to 20KHz. Pricing and availability will be announced during CES 2017. I’m looking forward to learning more about Muzen radios! I do love the designs. Click here to view the Air Smart Audio website (in Chinese). Post readers: Anyone familiar with Muzen Audio or own one of their products? Please comment! This entry was posted in AM, FM, New Products, News, Radios, WiFi Radio and tagged Air Smart Audio, John Figliozzi, Muzen Audio, Muzen Audio Classic 1, WiFi Radios on January 10, 2017 by Thomas.